Here is a riddle for you to answer. What is cool in the summer, warm in the winter, naturally hypoallergenic and smooth as silk? If you're answer is silk you are correct! Silk is a perfect cooling choice in the hot summer months and a warm cozy choice in the winter. How can it be both? Silk is breathable so it wicks away the moisture from sweat, keeping a person cool and comfortable. It is also a naturally draping fabric that gently hugs the body, eliminating air pockets and thereby holding in body heat better which will keep a person warm in the winter. It is a self adjusting fabric that seems almost magical. What are some other notable benefits of silk ? Silk is made from the cocoons of silkworms. Like nearly anything in nature, there are natural occurring substances in the cocoon of the silkworm that protect from various threats. Because the process of turning those cocoons into silk is a gentle one that does not strip away those natural substances, the benefits of them are still in the silk when you purchase silk. Dust mites, mold, and funguses all do not like those substances and stay away from silk. This means that silk is a perfect choice for people suffering from asthma and from certain types of allergies such as being allergic to dust mites. Silk is also mold and mildew resistant because of the sericin, a naturally occurring protein in silk, as well as several kinds of amino acids. I don't know if there is any scientific proof to this but it has been said on more than one occasion that the amino acids in silk are good for a person's skin and help delay wrinkling in the skin as well as being good for a person's hair. They are also said to be helpful to the central nervous system helping to calm a person. 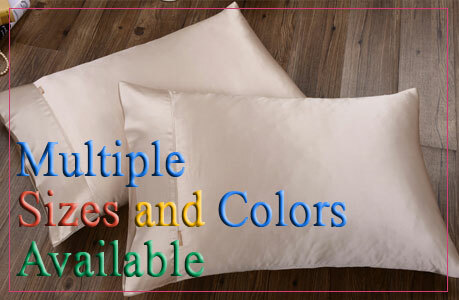 So even if you cannot afford to splurge on a whole set of silk bedding, invest in at least one pair of silk pillowcases or a silk pajama set. Anything that can help me avoid wrinkles for as long as possible and that may help me avoid having any more bad hair days is something I want. Silk is a naturally fire retardant material which makes it a wonderful choice as bedding. It is a highly recommended bedding choice for babies and children. Our fabrics are made from only natural fibres. Silk is one of the safest fibres you can wear next to your skin because it is naturally flame resistant. Where synthetics melt, silk burns to harmless ash. Silk is soft and extremely lightweight. You feel like you're hardly wearing anything at all. Silk keeps your skin dry because the hygroscopic silk fibre absorbs one third its own weight in moisture without feeling damp. The absorbed moisture is evaporated into the environment or absorbed by outer clothing layers. Your skin also dries fast – on or off the body. Winter and Summer, Silk provides thermal balance. Wear your Silk pajamas for luxurious warmth in winter or as a super-lightweight, breathable garment in summer that will keep you dry and cool. Its versatility makes it perfect for travel. Many fabrics claim to feel “soft as silk” but what could be better than the real thing? Synthetic fibres such as polyester were first developed last century from a desire to imitate the precious silk fibre. But silk has unique properties that no manmade fibre can imitate. There are some benefits to silk that are hard to quantify. If you have never slept on silk it is hard to describe how luxurious and sensuous it feels. Think of it this way, when someone tells you something has a silky feel what thoughts instantly come to mind. Do you imagine something soft and pleasant to the touch? That is what silk is. It caresses your body in softness. It is a wonderful feeling.